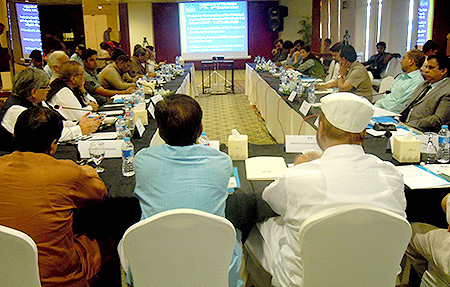 Tuesday, September 19: PILDAT held a workshop on the 20-point National Action Plan for Punjab Assembly Standing Committee on Home Affairs at Lahore. The workshop familiarized parliamentarians with the salient features of NAP, the stakeholders involved and shared the status of its implementation in Punjab. The Public Forum was addressed by members of the Standing Committee on Home Affairs, including Mr. Makdum Syed Muhammad Masood Alam , MPA-PML-N, Chairperson, Standing Committee on Home Affairs, Mr. Laal Hussain, MPA-PML-N, Major (Retd). Moin Nawaz Warraich, MPA-PML-N, and Rana Muhammad Afzal, Parliamentary secretary Home, MPA-PMLN. The forum was also addressed by Mr. Mujeeb ur Rahman Shami, Editor in Chief Daily Pakistan, Mr. Tasneem Noorani, Former Federal Secretary for Interior and Mr. Ahmed Bilal Mehboob, President PILDAT. Mr. Makdum Syed Masood Alam stated on the occasion that while a number laws relating to counter-terrorism measures had been passed through the efforts of the committee, the committee did not have the authority to call its own meetings and hold the government departments to account which severely limited its ability to undertake oversight on NAP. Mr. Rana Muhammad Afzal stated that Pakistan had paid a heavy price in the War on Terror, but its achievements had not been recognized. He emphasized the role of ordinary citizens in winning the War on Terror, and reaffirmed the resolve of the Home Affairs committee in doing everything in its authority to ensure implementation of NAP in the province. Mr. Chaudary Laal Hussain highlighted that parliamentarians are unable to perform their legislative and oversight duties as well because they are expected to deal with day to day issues and conflicts in their constituencies. He stated that empowering local bodies will be very beneficial in overcoming this hurdle. Mr. Rai Mumtaz Hussain Babar, Senior Secretary Punjab Assembly, stated that lack of authority for the standing committees to hold meetings on their own was a major hurdle. Nonetheless, many positive actions had been taken by special committees made by Punjab Assembly for purposes of oversight. He also assured the gathering that he will take the suggestion made at the workshop to the assembly and will discuss the same with the Minister concerened and the speaker of the Punjab assembly so that periodic review of progress on NAP could be made possible. Mr. Tasneem Noorani highlighted that while progress had been made in Punjab regarding NAP, there was a great need for national level leadership to take ownership of implementation of such an important document. National focal body NACTA had not become fully operational which created hurdles in better co-ordination between provinces and federal government on NAP. Mr. Mujeeb-ur-Rahman Shami pointed out that across the world, it was parliamentary committees who are responsible for oversight and review of executive action. He stated that media coverage of their meetings could have a positive impact and enhance confidence in elective representatives. Earlier while giving an overview of NAP, Mr. Ahmed Bilal Mehboob stated that periodic progress reports based on factual data should be issued by Provincial & Federal Governments and parliamentary committees should take responsibility for oversight in this matter. It is in view of the high importance of NAP and questions about progress in its implementation that PILDAT has undertaken this initiative. The purpose of this initiative is to highlight the need for the Parliament and provincial assemblies especially Punjab Assembly to take an active role in periodically reviewing the progress of NAP, and holding the government and all relevant institutions accountable. PILDAT strongly believes that greater transparency and more frequent public reporting on the progress of implementation will promote public confidence in the Governments and their ability to effectively implement the NAP. He assured the members of the standing committee and the Punjab Assembly secretariat officials of any support that they may need from PILDAT.